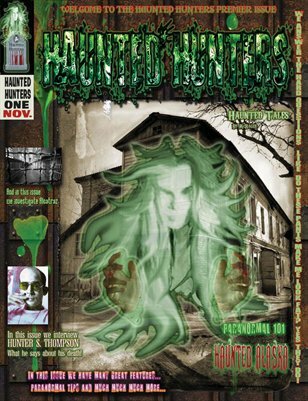 Haunted Hunters Magazine has it all! Hello and welcome to our Haunted House Magazine! We are your one stop shop for the very best of every aspect of the Paranormal. We are here to provide to you information about the paranormal, ghost hunting, and much more all in one place! And hey if you hear any voices or have any hallucinations you may want to share with us let us know what you would like to see featured! Just to wet your whistle: We have the one and only John Hanna, paranormal investigator and sensitive supreme to answer your paranormal and spiritual questions. We give you interviews from beyond! First up we interview Hunter S. Thompson the very first Gonzo writer and creator of Fear and Loathing in Las Vegas! So you say you’re a horror fan? Then just for you we have Monster Mac with all the latest news from the world of horror, movies, comics and books!